The University of Maine football team finished the 2012 season with an overall record of 5-6 and a Colonial Athletic Association (CAA) conference record of 4-4. On the surface, that doesn’t look like much. Dig a little deeper, however, and you’ll find more than just glimmers of excellence. “We ended the season with two great games and we’re just trying to build on that,” Black Bears sophomore defensive end Trevor Bates told me on Thursday night, less than 24 hours before the team flew to Virginia for Saturday’s season opener at Norfolk St. The two games to which Bates is referring are the final two games of the 2012 season. In those final two matchups, the Bears beat their opponents, Georgia State and Rhode Island, by a combined score of 106-13. Something to build on, indeed. Judging by all accounts, the Black Bears did just that to kick off their 2013 campaign, as they thumped Norfolk St. 23-6 Saturday night. The Bears’ effort and intensity against the Spartans showed exactly what they think of their 8th place preseason ranking in the CAA coaches’ and sports personnel preseason poll. Perhaps Bates should consider a major in History — he’s certainly got all his facts straight. Maine was, indeed, picked to finish 8th in the CAA in 2011. In spite of those low expectations, the Black Bears won the CAA regular season championship and, by way of beating former national champions Appalachian St. in the round of 16, advanced to the NCAA Football Championship Subdivision (FCS) quarterfinals. Although their 2011 season ultimately ended with a loss at Georgia Southern, Maine’s point was proven — they should not be underestimated. Early returns show other teams, the media, and critics may be making that same mistake this season. By conceding just six points to Norfolk St. on Saturday night, UMaine successfully held its opposition to single digits for the fifth time in its last 11 games, dating back to last season. The Black Bears also outgained the Spartans 377-224 and never trailed in what can only be considered a dominant road performance. The task, however, does not get any easier from here. UMaine’s next game is Saturday September 7 against former FCS power and current Football Bowl Subdivision (FBS — read: the BIG boys) school UMass at Gillette Stadium in Foxboro, MA. UMass is the first of two FBS schools on UMaine’s schedule this season, with Northwestern from the Big Ten being the other. Combine that with a traditionally difficult conference schedule in the always-stacked CAA, and achieving the same success realized in 2011 is definitely a tall order. According to Bates, that’s okay, though. One game a time. Seems like a good strategy to me. After all, that’s all you can win. 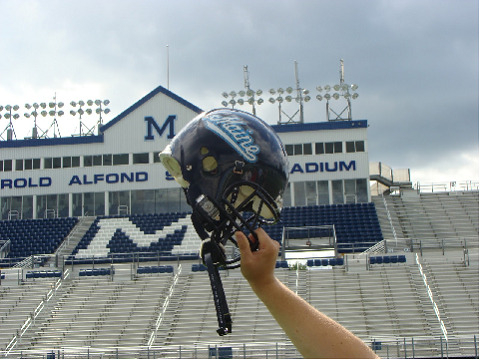 And if history’s any indication, the 2013 University of Maine Black Bears football team will win more of them than you think.